(Seychelles News Agency) - Over 60 Seychellois have recently benefitted from training from the United States of America in law enforcement, in particular, counternarcotics efforts. 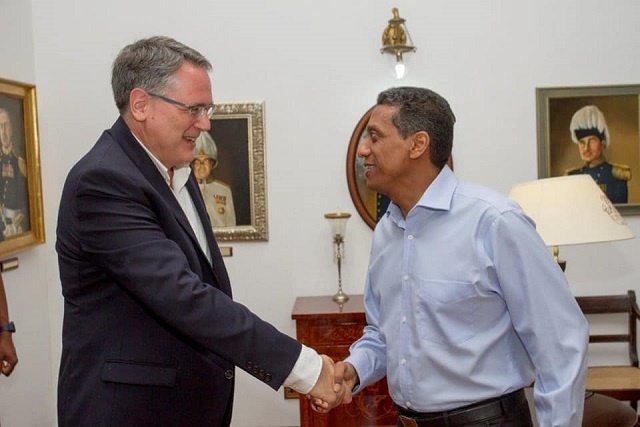 This was revealed by David Reimer - the United States ambassador to the island nation - on Thursday after paying a courtesy call on President Danny Faure at State House. The ambassador said these training were offered by the US coast guard, the Federal Bureau for Investigations (FBI) and the Drug Enforcement Agency. Reimer is on his sixth visit to Seychelles – a group of 115 islands in the western Indian Ocean - since his accreditation over a year ago. “We talked about a whole range of activities between our two countries and we focused on antinarcotics and some technical assistance that the United States is offering Seychelles,” said Reimer. The ambassador is on a 10-day visit to the island nation. During his stay, Reimer is having discussions with government officials, people from the private sector as well as with not for profit organisations. On Wednesday Reimer visited several projects that are being implemented by civil societies which benefited with funding from the USA. “I visited a nongovernment organisation which is doing wonderful work to rehabilitate drug addicts and we attended some practical training they were getting, so that once they complete their recovery programme they can go back to enjoying a normal life,” said Reimer who added that his country is working with both law enforcement as well as with not for profit organisations.